Four-color process printed on Side 1 of 80lb C2S White Gloss Text stock. Coated with Aqueous Gloss. 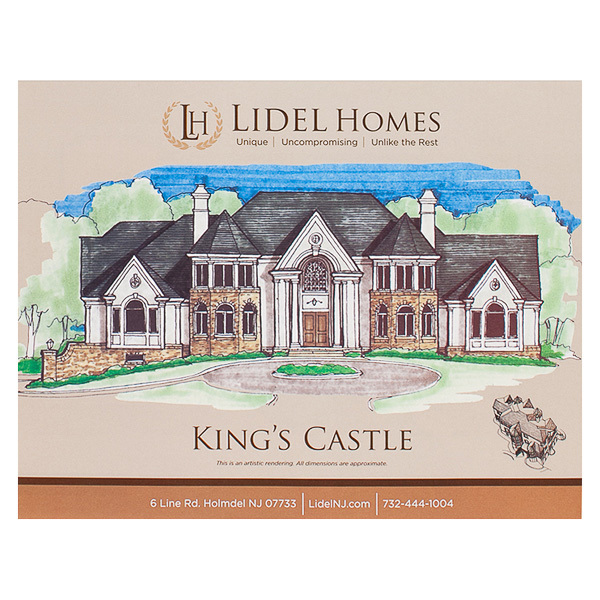 This stitched brochure advertises Lidel Homes, a luxury New Jersey neighborhood. The brand logo and values are printed above an illustration of a Lidel house. Two interior images reveal the first- and second-story floor plans, plus a list of amenities. A row of photos at the bottom provides examples of a decorated interior. The back panel includes a basement floor plan to reveal every inch of the reader's new home. Contact information is printed on every page to make sure it's always accessible. Four-color process printed on both sides of 80lb C2S Gloss Text stock. Coated with Aqueous Gloss. 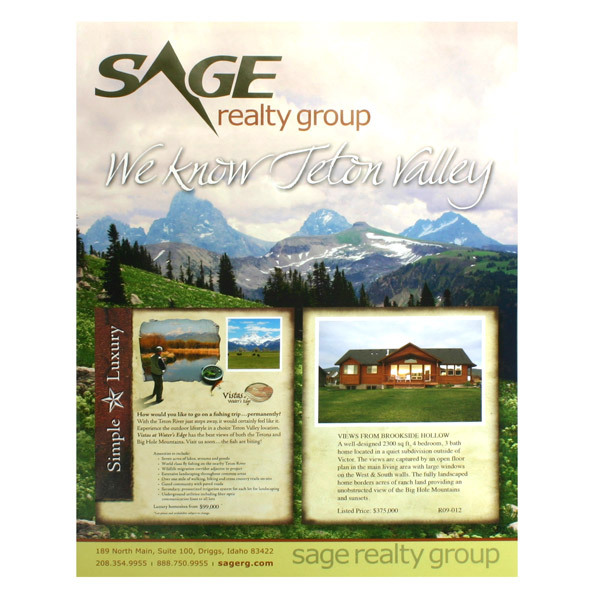 This colorful brochure for Sage Realty Group showcases more than a dozen breathtaking Teton Valley homes. A photo of the majestic Teton mountains occupies the cover; their summits rising into the sky point at the brand's name and tagline. Viewers who look closely will notice that the "A" in "Sage" is shaped like a mountain's peak. Yellow bands on the pages complement a dark green interior background, reinforcing the brand's colors. Each home's photo is accompanied by a pale tan box with property info. Contact information on the front cover makes it easy for potential buyers to get in touch with Sage and learn more about their dream home. Four-color process printed on both sides of 80lb C2S White Gloss Text stock. 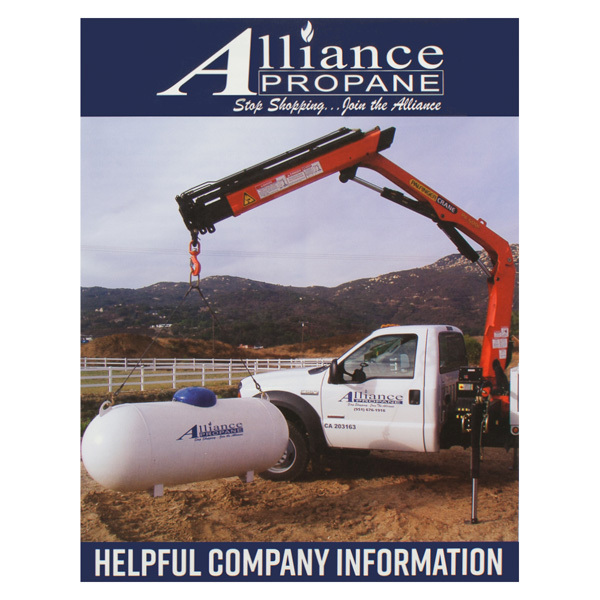 All of the information clients need is in Alliance Propane's business brochure. A propane tank installation image is on the cover. The blue and white color scheme signifies that the company is dependable. A flame dots the I in Alliance. Inside, customers can find information about delivery, payments and how to read billing statements. Company contact information is on the bottom. Services, benefits and frequently asked questions are on the back. Four 8 1/2" x 11" pages give you an opportunity to introduce yourself to clients with a company history, product information, or a personalized letter. This item's full-size pages have plenty of space for large bodies of text or colorful photos of products or team members. Because it's printed on standard paper, your brochure fits comfortably inside any 9" x 12" folder to ensure that it stays with the rest of your marketing packet. Dimension Closed: 8 1/2" x 11"
Dimension Open: 11" x 17"